Photograph by Dr. Obchant Thaithong. Letter #1: I think I recognized a picture in the last issue of Fraterna (18 #4) as one that appeared previously in The Hoyan in an article written by Dr. Obchant Thaithong. In The Hoyan it was labeled as being Hoya thailandica. In Fraterna it was labeled as being a hybrid cultivar of Hoya albiflora X Hoya sp. WMZ. Is it possible that this hoya is a hybrid that was published as if it were a new species? --- N. Sarvis. Reply: Absolutely not. Dr. Thaithong collected that hoya herself in northern Thailand at 2,000 meters above sea level in the Doi Inthanon mountain range. She described and illustrated it and published it in the Nordic Journal of Botany 19th January 2001. She is a lady with too much integrity try to pass off a hybrid as a true species. On the other hand, if you have back issues of Fraterna and its predecessor, Hoya Society West Coast bulletins from when Ms. Wayman was editor you can see that she almost never credited authors she plagiarized and never credited any photographers of photos she used (except her own). Once she copied an article I’d written after changing only a word or two here and there and signed her name to it. Once she copied a piece written by Dr. Carl Blume sometime around 1826 and signed it at the bottom, “By Ann Wayman.” She’s done it again in vol. 18, #4. Take a look at the table of contents. It says that there is an article running from pages 15 -17 entitled, “Why I Crossed The (sic) * Plants That (sic)* I Crossed by Ed Gilding.” It was written by Ed Gilding, or so it said on page 15 but if you go to the end of the article on page 17 you will see, “By Ann Wayman.” Who actually wrote it – I’ll be danged if I know! * In titles, articles are not supposed to be uppercased unless it is the first word of the title! 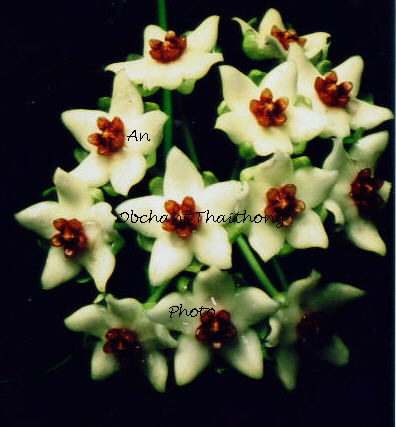 In the case of this picture which Ms. Wayman has mislabeled as being a cross of Hoya albiflora X Hoya sp. WMZ, the photographer (Dr. Obchant Thaithong) was not credited but I think it interesting to note that Ms. Wayman always credits the person who paid extra to sponsor the picture. In this case she credited Rosemary Peterson for paying extra to have the picture put there. With Ms. Wayman, the artists and the writers have no status --- she only credits those with deep pockets to whom she has access. The picture you referred to can be found in Fraterna vol. 18 #4 on page 11. It is the very same picture found in The Hoyan vol. 23, #2 (2001), page 28, in an article authored by Dr. Thaithong herself. On page 29 of the same issue of The Hoyan, at the bottom of the page you will see the notation, “Illustration and all photos by Dr. Obchant Thaithong.” I did not add that the picture was sponsored (paid for) by Christine M. Burton even though it was. I frequently paid for pictures myself when H.S.I. funds were short. Several other members also contributed without fanfare (David Liddle, William Drysdale, George Slusser, Frances Wilkes and Ben Hardy did too). Back to the picture in question – Even if I had not recognized the picture as being Hoya thailandica Thaithong, I would have been very sure it could not be a cross between Hoya albiflora and Hoya sp. WMZ. Why? 1). I think it very unlikely that two species with solid white flowers (except for a red star on the corolla), with solid white coronas would have offspring with white corollas (no red star under the corona) and dark red coronas. Of course recessive genes might account for a red corona but that would at least hint at one or more parent being a hybrid too. That would be possible but I think unlikely. 2). I think it unlikely that two Australian species would produce a hybrid that Dr. Thaithong would find in a forest in northern Thailand. Letter #2: What is your opinion of the “NEW” Fraterna? --- Too many people to list here. Reply: It’s a great improvement over anything they’ve put out in the past. It is finally the “Layman’s Language” publication they promised in the beginning. For the first 5 or six years they insulted their readers by calling it layman’s language as if laymen misspelled 35 to 40 words on almost every page they wrote. For the rest of the time all they got was DK’s pseudo-technical drivel with almost as many misspelled Latin words (as if Latin were layman’s language). This one issue is the only “layman’s language” issue in that organization’s history. Either Ann Wayman has taken a remedial spelling course or has finally allowed those ladies she used to advertise would “Make your writing look like a million dollars” see copy and correct it before going to press. Few misspelled words is a great improvement. Letter #3: Anything else in this Fraterna that you think wrong? – N. Sarvis. Reply: Yes, there are a couple or three things. 1). I think it was meant as humor but I think it fitting that they’d name one of the editors of an advice column as Dr. Quack! 2). I think too that one of the author’s referring to the “Eriostemma” genus was wrong because until there is a valid publication of the name Eriostemma as a genus, there is no Eriostemma genus. Kloppenburg and Gelding tried to publish that genus name several years ago but their publication was NOT valid. 3). Mr. Green made a false statement in his article on Dischidias. There are two things wrong in that statement. 1). He defined “bullate” as “swollen & hollow. None of those definitions say anything about “swollen and hollow.” I can think of several Dischidias that are swollen and hollow and I can think of several that appear puckered and blistered. I can think, off hand, of only one Dischidia that is both swollen and hollow and that also appears puckered and blistered. That is Dischidia major. It could be described as “bullate” because of the puckered and blistered appearance of its leaves but NOT because it is swollen and hollow. 2) Since Mr. Green THINKS that bullate means “swollen & hollow” he seems to have overlooked Hoya darwinii when claiming no hoyas are “bullate.” Hoya darwinii has two types of leaves. One type looks like normal “leaf leaves.” They are more or less (mostly more) flat with entire margins. The other type looks a little like green golf balls. This type of leaf is formed when the lateral leaf margins stop growing while the rest of the leaf continues to grow. This causes the leaf to roll up into a ball. While not entirely hollow, the leaves consist of several hollow chambers, which are occupied by ants and hoya roots. Hoya darwinii leaves are swollen and hollow but they are NOT bullate because they are smooth, not blistered or puckered. I know this is true because I have seen them myself. My plant formed those “smooth surfaced green golf ball” leaves very shortly after I first got it. MY CONCLUSION: The new Fraterna is a big improvement over any previous issue. It will appeal to the untutored masses who are more interested in having their misconceptions validated. It is those still on Gerber’s but will have little appeal to beef eaters! NOTE: I have defaced the photograph as I will all in future issues by writing the photographers’ names across the center. This is because so many picture thieves copy from the internet and then try to claim others’ pictures as their own.